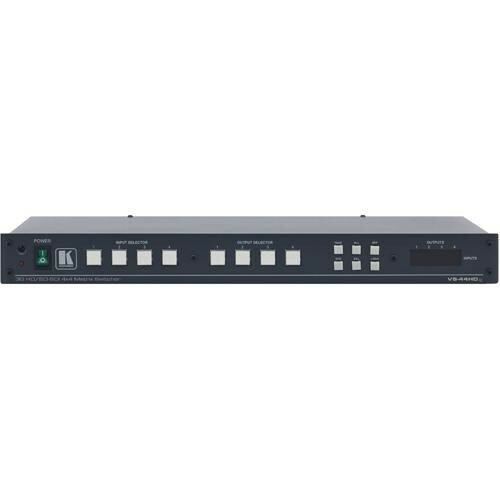 The VS-44HDxl 4x4 3G HD-SDI Matrix Switcher from Kramer is designed to manage SD-SDI (SMPTE 259M and SMPTE 344M), HD-SDI (SMPTE 292M), dual-link HD-SDI (SMPTE 372M), and 3G HD-SDI (SMPTE 424M) signals. It offers a 4x4 matrix switching configuration. Switching is implemented during the vertical interval period according to the SMPTE RP-168 standard. Dimensions (HxWxD) 1.75 x 19 x 7"
Box Dimensions (LxWxH) 21.6 x 11.0 x 4.25"